Susan Prolman, Executive Director of the National Sustainable Agriculture Coalition, guides the organizational development and implementation of NSAC’s strategic vision. She is a graduate of Georgetown University Law Center and a member of the DC Bar. She has advocated for a more sustainable approach to agriculture for a decade. Caryn Hartglass: Hello, I’m Caryn Hartglass and you’re listening to It’s All About Food. Thank you for joining me. It’s August 1st 2012. August 1st. Here we are, in the middle of summer, feeling it in different ways depending on where you are: maybe it’s too hot, maybe it’s too cold, maybe it’s too dry, maybe it’s too wet. I don’t know, is it ever just right? Well, here on this show we talk about food. I like to say each food has its own story. One of the foods that’s in front of me right now, with all kinds of story, is corn. We’re seeing corn connected to so many different things, not just feeding us and whether it’s healthy or not to eat particular kinds of corn, but it’s associated with drought and energy and relations with other countries. It’s connected to so many different things. And I know that so many of use are overwhelmed with our own lives and all these different things that are going on in that it’s really hard to think past today but we need to. We all need to take part, to take responsibility in what goes on all around us, not just for today and for today and the next month but for years and decades ahead, to make sure things are sustainable. The key word: sustainable. We’re going to be talking a lot about sustainable agriculture today and that Farm Bill thing that’s running around in our government that’s kind of overwhelming and confusing. And perhaps we’ll going to bring a little clarity today. And I’m going to bring on my guest, Susan Prolman, who is the executive director of the National Sustainable Agriculture Coalition and she guides the Organizational Development and Implementation of their Strategic Division. She’s a graduate of Georgetown University Law Center and a member of the D. C. Bar. She has advocated for a more sustainable approach to agriculture for a decade. Welcome to it’s All About Food, Susan! Susan Prolman: Thank you very much, Caryn! I’m so happy to be here. Caryn Hartglass: Thank you and thank you for joining me with not very much notice. Susan Prolman: Oh sure, it’s not a problem. I appreciate it. Caryn Hartglass: But I have been so wanting to talk more about sustainable agriculture and the Farm Bill on this show so I’m glad we’re finally going to do that. Can you tell me a little bit about National Sustainable Agriculture Coalition? I love when people work together. That word coalition, I love. Susan Prolman: Yeah. And we are a true coalition. So we have a staff of 10 people here on Capitol Hill. We’re right across from the Capitol Building. We go and we speak with members of Congress and also with people from the agencies, including leaders at the USDA. But we’re also a coalition of over 90 member- organizations form around the country. These are organizations that work with and represent farmers from around the country. They get out to the grassroots and they tell them what’s going on in Washington in terms of federal agricultural policy. And they get people to weigh in with their members of Congress and with other opinion leaders and decision-makers at pivotal times. So we are a coalition; we do form our policies in a democratic way based on the feedback we get from farmers and consumers about what’s working for them on the ground. Caryn Hartglass: Okay that sounds really good. I think part of the problem, sometimes, with our government is most of us are so busy that we just like to leave it to them and they’re not doing a very good job, certainly not with our food. Susan Prolman: And one thing I would say is that every taxpayer is contributing to the Farm Bill. The Farm Bill is this large legislative vehicle. It’s what sets most agricultural policies in this country and the current Farm Bill that Congress is now debating costs $1 trillion over the course of 10 years. It’s your money so you have a lot at stake and you have a right to be heard. Caryn Hartglass: Yeah, and when we’re paying … I wish when I was filing my federal income tax return every year that there was a box, a bunch of boxes, of how I could select where my taxes would go but unfortunately, that doesn’t happen because there’s a lot of things I wouldn’t be supporting with my taxes. Susan Prolman: And the way you do that … I mean, the mechanism that our Founding Fathers gave us is you get to vote members of Congress. You are their constituent and you get to let them know how you feel about the job that they are doing and how they should vote on questions that are arising in Congress. Caryn Hartglass: We’re going to talk more about that but let’s get into some of the nitty gritty possible about the Farm Bill. So my understanding is … maybe we can talk a little bit about the history. In its inception it really was doing wonderful things and over time and re-scripting of the bill, it’s kind of gotten a little out of control. Susan Prolman: Yeah. So the Farm Bill, just to give an overview, this is the big piece of legislation that sets agricultural policy for the federal government. It comes up about once every 4 to 7 years, something like that, and it spends a lot of money. Now, the number one place it spends money currently is in nutrition programs. But it also spends money for programs like direct payments and crop insurance, which subsidize a small handful of real crops and these are things like corn, soy, cotton, rice, wheat, things like that. And then there are other programs like energy programs and world development programs and research programs. So all of these are encompassed within the Farm Bill. Caryn Hartglass: The thing is, people will say, “But why do I care? Why should I care?” There are a lot of reasons why we should care. Susan Prolman: There are a lot of reasons why people should care. First of all, some of the smaller programs in terms of dollar amounts do a lot of great work on the ground. So there’s a program in the current Farm Bill called The Farmer’s Market Promotion Program; this helps to get farmer’s markets into communities. And it also helps for low-income Americans who are receiving SNAP, the Supplemental Nutrition Assistance Program Benefits, which were formerly called Food Stamps; it helps them to use those at farmer’s markets. So there’s a lot of great things that the Farm Bill does. The Senate version of the new Farm Bill, it’s still working its way through Congress, but the Senate version contains a provision that would give you double benefits if you are a SNAP recipient at farmer’s markets. In other words, encouraging people to eat healthy locally produced fruits and vegetables. Caryn Hartglass: Oh, I like that. Susan Prolman: So it’s a hodge podge of some things that make people deeply concerned and other things that a lot of people greatly support. Caryn Hartglass: You mentioned, just briefly, crop insurance. And I understand that there are some movements from subsidies to crop insurance. Can you explain a little about crop insurance and why some people are going in that direction? Susan Prolman: Sure. There are different titles of the Farm Bill. One title is the Commodity Title; that’s where direct payments are housed. Another title is Insurance. And we believe, in fact, in having a safety net for farmers. Farming is a risky business; there’s weather, there’s price fluctuations, there are reasons to have some sense of certainty in terms of farming. Traditionally, in past Farm Bills, the Commodity Title with its direct payments has been a much larger title in terms of money going out the door than the Insurance title. However, that’s changed: now Insurance is significantly bigger than the Commodity title. There’s been a drumbeat by some of the top opinion leaders around the country that the direct payments are not a good system and they should go. And Congress is hearing that message to a certain degree. But the concern is, are they just shifting that same amount of money from direct payments into insurance payments? The way that the insurance works in the Farm Bill is the USDA has a handful of, maybe 13, private insurance companies. Taxpayers subsidize part of the premiums that the farmers pay for for insurance and they also subsidize the private insurance companies for some of their administrative costs of running the Insurance program. What we at the National Sustainable Agriculture Coalition say in regard to these types of payments is they should be fair and they should reward good action. We want them to have reasonable limits so that some of the wealthiest farmers don’t get obscenely huge payments at the taxpayers’ expense. We want them to be coupled with basic conservation requirements so that we’re not inadvertently giving people incentive to break out new land or to farm on sensitive and marginal land that harms the environment and cost the taxpayers a lot of money. Caryn Hartglass: Obviously, you’re recommending these things because it’s a good policy but also because there is a bit of abuse that goes on with the Farm Bill. There have been larger, high revenue farms that are … the mega-businesses that aren’t these cozy, individual farmers we have in our mind, image, where they take advantage of the Farm Bill; they find the loopholes and find ways to get … I want to call them subsidies but sometimes it’s insurance and the pet farms out there getting it. Susan Prolman: Well, insurance is a subsidy. And you’re exactly right. First of all, the system is designed to allow what some people would consider abuse to start with. And then there are loopholes that we say that are big enough to drive a tractor through. So you’re right on; you’re right there. Caryn Hartglass: Yeah. So it needs to be fair. Caryn Hartglass: So the question is, there are coalitions like yours that are making recommendations and you go across the street and you talk to people, what are their responses? Susan Prolman: Well, we were very pleased in the Senate that we were able to get a lot of helpful reforms. So the process starts with the Senate Agriculture Committee, where we were able to get some good some language in there. Then it went to the Senate floor and there were some good amendments passed and also some bad amendments fended off. Let me make a point that the current Farm Bill … so the Farm Bill is a nickname; it’s not the true name of the piece of legislation. The current law is called the Food Conservation and Energy Act of 2008. The Senate’s current bill for the new Farm Bill is called the Agriculture Reform, Food, and Jobs Act of 2012. The House Agricultural Committee’s bill is called the Federal Agriculture Reform and Risk Management Act of 2012. The point I’m making there is that both of them say “reform” in their title. The question is, how much reform is there? We were able to get some good reform through the Senate, less so on the House side, so far. Caryn Hartglass: That’s not surprising. Okay. So what have been some of those reforms on the Senate side? And ultimately, everybody’s got to agree in order for them to happen. Susan Prolman: Yes. Right. Ultimately, everybody has to agree and it’s hard. Again, the basic reforms that we want to see are payment limitations so that some of the wealthiest farmers don’t get unlimited payments under the various subsidy programs, and linking, receiving subsidies to taking some basic care of the environment and not doing harm to wetlands, native grasslands, etc. and a variety of other reforms that we have. Those are what we’re hoping to achieve at the end of the day. Caryn Hartglass: Now, I was reading about the history of these farm bills that have had different titles over the years for different reasons. And originally it was, I guess, after World War II … oh no, it started before, like in the ‘30s, I think. Susan Prolman: Yeah. So Farm Bills were initially a reaction to the Great Dustbowl, during the Great Depression. Caryn Hartglass: And so it was helping with all of the problems associated with the Dustbowl and then trying to prevent things like that from happening in the future. And then here we are, not quite 100 years later, but a lot of things have changed: our technology has changed; our type of farming has changed. And to get the laws to support our needs and come up to the current time is what’s really difficult. Susan Prolman: Yeah. And also, if I might jump in and add, that for a good chunk of time there was a philosophy in federal agricultural policy: get big or get out. And policies were written around that and, to a great degree, are still written to benefit some of the largest producers at the expense of small and medium-sized producers. We believe that there’s a role for producers of all sizes but we don’t support a system that squeezes out small and middle-sized producers; they should be able to thrive and contribute healthy foods to their communities. And the best part of where we see a lot of room for improvement in agricultural policy. Caryn Hartglass: Well, we’re seeing the negative effects of not having small farms. Our economy is a mess and many small farmers have been pushed out of their business because it wasn’t economically feasible for them to produce a small amount of whatever that was they were growing. As a result, these mega farms are using less people and finding ways to minimize their expenses so they can sell food very cheaply but it’s had a very expensive cost to employment, to jobs, and what’s really important to me is, the quality of the food isn’t even as good. Susan Prolman: Yeah. And I would say that some of the economic efficiencies are truly illusions, that some of the ways that the largest farms support themselves are through subsidies from government and that could be federal, state, or local government. Plus, through being able to externalize some of their costs on to others by not being strictly enough regulated and that could be anything from pollution costs of water, air, and all kinds of pollution. But it also can be unfair business practices that harm others. And so in the House Agriculture Committee’s Farm Bill, there was a really bad amendment that was added during the mark up, it’s a term of art that makes it less competitive. So the USDA has been trying to implement some regulations to improve competition so that segments aren’t dominated by some the largest producers. And so in the case of poultry, the poultry industry of vertical integrators that have unfair advantage over producers that fall under them in those sectors of the market. People have been trying to fix this problem but you have some in Congress, including the House Agriculture Committee, that are trying to go the opposite direction. Caryn Hartglass: Well, the whole story behind animal agriculture is a nightmare, from my point of view; I’m a vegan and I promote a plant-based diet and encourage people toe at more plants as much as possible. But certainly there’s been a lot of problems with factory farming, with CAFOs (concentrated animal feeding operations) and so much abuse, so much pollution, and so much unfairness and yet they have a tremendous amount of power. I understand the whole vertical integrated thing is crazy, how we allowed it to happen, where small farmers can’t get their animals slaughtered or they can’t get their animals distributed and these bigger operations that treat the animals so much more horrifically and do so much more polluting get all the benefits. Susan Prolman: Yeah. That’s part of what I’m talking about. We have to have a system that allows small and middle-sized producers to be able to thrive and survive. And a system that, for example, if you have all of the federal-inspected slaughterhouses owned and operated by large integrators that don’t allow some of the small and mid-sized producers to add their animals into those slaughterhouses then they’re going to push themselves out of business. So Congress and the USDA have been doing some things to try to address those problems but again, we take some steps forward and we take some steps back there. Caryn Hartglass: I was talking earlier about corn. Corn is connected to so many crazy things these days; it’s just unbelievable. So I remember reading a few months ago that the farmers planted a record number of acres of corn and everybody was jubilant. Then later on that day I read about the droughts that were coming and all the acreage that were lost. And it’s all connected: overplanting, and corn that’s being used, not only a very small amount to feed people. Hello! Most of it, either to feed animals, to feed people, and some of it goes into energy. Susan Prolman: Yeah, that’s right. The two biggest uses of corn … and again, corn is heavily subsidized in a lot of different ways through our Farm Bill. And the number one way it’s used is ethanol production so there are a lot of federal government promotions of ethanol and therefore, of corn growing, and also for the use of animal feed. They’re used in animal feed. And it’s an open question that people are asking is should we keep pushing ethanol production so hard if we have a corn shortage or the prices of corn are rising so high that it makes it unaffordable for many? But I can go back to your original point that when people hear about things like corn and soy, their mind goes to the corn on a cob that they bought at the farmer’s market or the tofu burger that they’re eating, something to that effect, or tofu, but a lot of this isn’t going to human food directly. Caryn Hartglass: Yeah. Human food is a drop in the bucket. Susan Prolman: And by the way, one of the interesting facts about the Farm Bill is that things like fruits and vegetables are called specialty products. Caryn Hartglass: Don’t you love that? Susan Prolman: The things that I eat, the food, those types of things are some of the specialty items in the minds of the people who craft the policy. Caryn Hartglass: Yeah, we need to change the way we think about food, that’s for sure; at least get our government to change. So the thing about ethanol is really interesting because I know that a lot of Congress people are waving this flag about how great it is because we need to become energy independent and yet I’ve read some crazy numbers that it takes 2/3 fuel, either coal or other non-sustainable sources, to make energy from corn. So it’s not very efficient; it uses a lot of other energy. And it’s not as green as we think it is and of course, it competes with our food supply. Susan Prolman: Yeah. So there are definitely energy input costs that go into the production of corn. So if you have vast acreage in mono cropping row crops, fence row to fence row, as they say, and they’re having fossil fuel-based fertilizers and a lot of energy-intensive farming techniques. The question arises and people have done analysis these days is how efficient is this of a way of producing energy? Caryn Hartglass: But that information really isn’t getting out there. A lot of people think this corn for ethanol is a good thing. Susan Prolman: Yeah. That’s an interesting point about the public messaging around that. Susan Prolman: But in Congress, if you look at the motivation of the folks, if you come from a corn belt state you want to bring home the bacon for your state so the more federal support you can get for corn production, the better, if you are from a district of state that is a big producer of corn. Caryn Hartglass: But I think, maybe, some of that wealth isn’t really from the sale of corn; it’s from the government subsidies related to the corn because the more we grow, it’s that supply and demand thing, the cost goes way down and we don’t sell the product for very much. Susan Prolman: It depends on demand so in the case of corn, demand’s been very high because of the ethanol requirement so it really varies. But I take your point. The bigger question, if you sort of step back from specific crops and ask the bigger question is, what do we want our federal agriculture policy to deliver to the American people and how do we craft policies that do that? One of the things that you don’t see much of in the Farm Bill consideration is we have an obesity epidemic in our nation. Caryn Hartglass: Yeah, healthy, affordable, sustainable food. Susan Prolman: Yeah. And how do we deliver the kinds of foods that people should be eating, to them, in an affordable way? Those are really good questions to be asking. Caryn Hartglass: Well, those specialty products have to become a lot more special. Susan Prolman: We’re a lot less special. Some of the things that the National Sustainable Agriculture Coalition supports are farm-to-school programs, where we connect farmers with children in schools. This serves a lot of purposes: one is just to get them fresh locally produced healthy fruits and vegetables and other kinds of foods, but also to have them engage in school gardens and to get out to farms, meet farmers, and learn where their food comes from, to establish lifelong healthy eating habits. Caryn Hartglass: Okay. So someone in their neighborhood wanting to get a farm-to-school program going, do you know how one would do that or where they might go to get more information? Susan Prolman: Well, if I were in such a situation I would go to my child’s school and talk with their administrators and say, “We’d like a farm-to-school program.” There is some federal funding and there is an open-grant cycle and it will become open again for those proposing farm-to-school programs to get funding to get them off the ground. But there may also be state and local money available for that. I have to say it’s a very popular project and it’s really spreading around the country and I think people should have them in their communities. Caryn Hartglass: Absolutely. Well, it comes back down to each one of us being responsible for our lives and our communities and we have to move our butts a little bit to make it happen. Susan Prolman: Yeah. What do we care about more than the food that we, as a society, eat, that we personally eat, that we feed our families, and that people around us are eating, and the impact of that has on the health of everybody? Caryn Hartglass: I would like to think that our elected officials want the same thing that we want. Doesn’t everyone want healthy food that’s affordable? That’s kind of what confuses me. And then I think, what is it that’s confusing our elected officials? Are they hearing or they’re being lobbied by big ags so much that they get confused? Susan Prolman: I think it’s that if you look at the realities of the situation, if you want to get a bill passed so for example, the National Sustainable Agriculture Coalition very much would like to see the new Farm Bill passed this year, in 2012. What does it take to get that passed? And people, again, have interest in their state or district, whatever type of growers it is that they have to try protect their concerns. You have to figure out how do you get the votes to pass what you need to pass? I’ll give you an example of that: again, the number one biggest expenditure of the Farm Bill is nutrition benefits and that includes the SNAP benefits, formally known as Food Stamps. Well, the House is approached but we’re in, as I’m sure you know, a big deficit- cutting atmosphere up here on Capitol Hill. So the House that’s approached wants to cut a lot of money out of the nutrition benefits and SNAP benefits. They don’t know right now; they haven’t scheduled a time to bring the House Agriculture Committee’s bill to the floor because they don’t know if they can pass it and part of the reason for that is cutting so much money out of that nutrition program is controversial and a lot of people might vote against it. 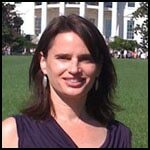 Caryn Hartglass: I was reading your most recent blog post from your website, nationalsustainalbleagriculturecoalition.net, about how the House is trying to get the current Farm Bill extended. Susan Prolman: Yeah. What happened there, the House Agriculture Committee, which is chaired by Congressman Lucas with ranking member Congressman Peterson, passed a bill out of the Committee. And we would like to see that bill go to the House floor so it can be debated and amended in a normal process; however, the leadership of the House, including Speaker Boehner, wanted to just pass a 1-year extension and kind of circumvent the House Agriculture Committee. Fortunately, that attempt appears to have failed, which we think that was a good thing. We were arguing against that kind of extension. Caryn Hartglass: Yeah, we would like to see some action and get some changes made. Susan Prolman: Yes. We’d like to see some real reform. Everybody’s putting the term “reform” in their title but let’s get some real reform. Caryn Hartglass: Yeah. Okay, lots more to talk about but I want to take a quick break so Susan, stay with us and we will be right back to talk about probably more about the Farm Bill and other food-related issues. Susan Prolman: Great! Thank you, Caryn. Caryn Hartglass: Hello, I’m Caryn Hartglass. You’re listening to It’s All About Food. And thank you so much for joining me on this 1st day of August in 2012. And I am speaking with Susan Prolman, the executive director of the National Sustainable Agriculture Coalition. Susan Prolman: Thank you, Caryn. Caryn Hartglass: You’re welcome. And thank you. So the big chunk of the Farm Bill is the food security portion, the SNAP program, and the good old food stamp program and that’s changed a bit over the years too. And hopefully … there’s a lot of talk but it’s not moving very quickly; we don’t do anything very quickly. But I would think that if we were giving people who were food insecure, people who were hungry, people who didn’t have access to enough food with their own financial, and they needed help that it should be healthy food. Unfortunately, we’re seeing more people that are using the SNAP system that they are overweight, obese, and are not making the right choices. Susan Prolman: Well, one comment I would make to that is that if you look at the American population as a whole, we’re becoming heavier and we’re making some bad food decisions. And I don’t know if it’s that the people who are using SNAP benefits do that more than the average American. I think it’s of a great concern right across the board. Now what some folks is trying to do is give incentives fro people to choose healthier foods. So Senator Stabenow, the chairwoman of the Senate Agriculture Committee, included in her Farm Bill a Double-Up Buck Program so that if people take their benefits to the farmer’s market they get twice as much value; they double the value as compared to purchasing other foods. And that’s an incentive way; it’s a carrot way of getting people to make some really good food decisions. Caryn Hartglass: Now, there are lots of people in this country who are taking advantage of this program. It just blows me away how many people use it. Susan Prolman: It’s grown a lot in recent years and that is due largely to the recession. Caryn Hartglass: Yeah. So it’s really good that it’s there, even though some people might want to get rid of it or reduce it but it really is important and one of the benefits of living in a wealthy country that can provide security in numerous different forms. But it has its problems, the program, and there had been some improvements. Susan Prolman: Yeah. It does but let me say that there are other programs in the Farm Bill that have a lot more institutional problems built into them than the SNAP. I hear a lot of verbiage on Capitol Hill about abuse of the Supplemental Nutritional Assistance Program and clamping down on abuse. I wish I heard that much discussion on abuse, for example, of the crop insurance program. Caryn Hartglass: The crop insurance is a smaller portion of the Farm Bill but the people that abuse it really abuse it big. Susan Prolman: It is smaller; that’s true that the Nutrition Program is, by far, the biggest slice of the Farm Bill. But I would also argue that’s a reason why everybody’s invested in the Farm Bill. If you are a taxpayer, you’re contributing to it; if you are a consumer, it impacts you; and if you care about poverty in this country and whether low-income people, including those who are working jobs or multiple jobs, are getting the support that they need. I think that everybody has a stake in the Farm Bill fight. Caryn Hartglass: We have our problem with food deserts in this country. Is the Farm Bill … does it deal with problems like that? Susan Prolman: Yeah. There’s a Healthy Food Financing Initiative that we’re trying to get off the ground to address some of the food desert problems. Also, the National Sustainable Agriculture works really hard to develop local and regional food systems. We have a marker bill that we’re strongly supporting. It was put in by Congresswoman Chellie Pingree of Maine and Senator Sherrod Brown of Ohio; it’s called the Local Farm’ Foods and Jobs Act and it’s trying to rebuild everything from farm, to distribution, to consumer to get that healthy food to people, including vulnerable people who are located in places that don’t normally have access to healthy food. Caryn Hartglass: I was reading in Dan Imhoff’s book, Food Fight, and that’s where I got a lot of better understanding of what’s going on in the government. There are different … The money that is in the bill that goes to different places, there are two kinds: some of it can be permanent, others are sort of soft and can be changed. But it seems like all of it can be changed anyway but some are more permanent than… temporary permanent and others are temporary. Susan Prolman: Bingo. You got it right. So Congress seems to have changed the rules; if they’re playing the game, it can be frustrating sometimes. But you have two different types of money. So the Farm Bill is an authorizing bill and it authorizes funding for programs in two ways: one, with mandatory money and two, with discretionary money. So the premise of mandatory money is that Congress has passed that amount of money and that’s going to be in the program, no questions asked. Whereas the amounts that are appropriated, they’ll say, “We want $50 million appropriate X-year for X-program” but that has to go each year through the annual appropriation cycle. There are appropriations committees in both the Senate and the House of Representatives and they make those calls, sort of like, “Here’s so much money we have.” They couldn’t, in theory, appropriate more; often, they appropriate less. But what we’ve seen recently is a mechanism called CHIMPS. CHIMPS stand for Changes In Mandatory Programs. So Congress has been doing, in recent years, something that one would think they wouldn’t have done, which is they’re taking mandatory funding out of programs, for example, in the Farm Bill Conservation Program; it was funded with mandatory money. They reward the best stewards of the land; they reward farmers for reducing pollution, reducing reliance on fossil fuels, etc. etc. and Congress has been pulling money out of those programs even though it’s mandatory money, in recent years. Caryn Hartglass: So that should be a good thing. Susan Prolman: No, that’s a bad thing. The conservation programs, in our opinion, are a good thing; underfunding them is a bad thing. Caryn Hartglass: Right. But taking money from another program to fund them is a good thing, then that money gets pulled out of it anyway. Susan Prolman: What we’ve seen happen is that Congress often goes to these good conservation programs as a go-to place, like an ATM to take money for other things. So the House is currently discussing how we pay for drought. Now, there are drought provisions in both the Senate and the House bills and we say if you want to address drought, pass the Farm Bill for here. What some of the folks are saying in Capitol Hill is, “Let’s pull money away from the conservation programs and put it into emergency drought relief. “So underfunding and always using the conservation programs as the go-to source of money for other objectives is something we cannot support. Caryn Hartglass: Obviously, well, it’s obviously not obvious to some people but we wouldn’t have the droughts or at least not the magnitude that we’re seeing today if we had some really rigorous conservation policies in place. Susan Prolman: Yeah. Part of being sustainable, if you are farming for the long term, so you’re trying to reduce your inputs; you’re trying to reduce the impacts of the agriculture that you practice; you’re trying to reduce soil erosion and water pollution run-off and things like that. Not only reducing energy used but in a renewable way producing energy in a way that benefits the environment. These are all exciting things; there’s a little bit of money for them in the Farm Bill and there could be a lot more. Caryn Hartglass: Yeah. It’s so hard for us to look ahead and plan for the future. We want everything right now. Susan Prolman: I’ve been hearing the energy conservation political speeches from Jimmy Carter on in the ‘70s. Caryn Hartglass: I know. And gosh, I dream of what we could have had today if we had really made some significant differences back in Jimmy Carter’s time. Susan Prolman: That’s, again, to get to the point why people should care about the Farm Bill. It’s your money and it’s an opportunity to invest in smart policies for the future and it’s an opportunity that Congress doesn’t make the most of. And that’s why they need to hear from you. Caryn Hartglass: I absolutely agree. It’s just our society, not everyone, but many people are so shortsighted today and just want to take care of their immediate needs. There’s another big piece involved with commodities, commodity programs. What are in commodities? Susan Prolman: Again, it’s a handful of crops like corn, soy, wheat, cotton, and rice that get payments. And there are different types payments through the commodity titles. There are direct payments and that may shift into a revenue program called ARK in the new Farm Bill. It’s basically supporting farmers to grow those row crops. Caryn Hartglass: And how did those crops get so lucky? Caryn Hartglass: Yeah. So that’s corn, and soy, and cotton, and wheat. Susan Prolman: It’s a big part of what our country produces. But the problem is that there are disincentives in the system. So if you are receiving a lot of government subsidies to grow a large tract of land, mono crops for a crop like corn or something, you actually can get penalized if you also grow fruits and vegetables on that land. There’s a provision we’re trying to fix through the new Farm Bill where if you are an organic producer and you seek insurance, you pay a higher premium than conventional production on the theory that organic is more risky. And then if you have a lost, you get paid out at conventional prices. So it’s like a double whammy against organic production. So we’re trying to sort of fix some of the disincentives in the program. Caryn Hartglass: I have to take very slow, deep breaths from time to time because this stuff really can make my blood boil; it is just so awful. We could just be so phenomenal if we would make some very simple changes but then a few people would lose. Susan Prolman: I would say that most people, and more and more people, really care about food and they’re thinking about where their food comes from and there’s a lot they can do. So there are a couple of things that I’ll refer folks to right now. You mentioned our website, sustainableagriculture.net. If you go to sustainableagriculture.net, you can sign on to our citizens’ petition. And that basically says we want policies that help sustainable farmers. You can also sign up for our action alerts. And everywhere where there’s something as important happening in the new Farm Bill, we’ll let you know and give you an opportunity to weigh in with your members of Congress. Caryn Hartglass: Now let me ask you, what do you do with petitions that people sign? Susan Prolman: We are gathering thousands of signatures of people from around the country and letting our folks on Capitol Hill know that but also letting those folks know when they have opportunities to weigh in. So if the Farm Bill comes to the House floor, we might send you an action alert saying, “Today’s the day. Call your representative and tell him or her to vote for organic” or something to that effect. Caryn Hartglass: Right. And we have to believe that if they get lots and lots of calls, it will make a difference in how they vote on the floor. Susan Prolman: Yeah. An optimistic example is when the Senate floor took up the Farm Bill; they made a lot of really good improvements to it. They voted for a lot of good amendments and against a lot of very bad amendments. And they did so because they heard form their constituents. Caryn Hartglass: Right. So we have to be noisy. Susan Prolman: Yup. For sure. Caryn Hartglass: Yeah. So going to sustainableagriculture.net will keep us on top of the things we need to be noisy about. That’s good to know. Caryn Hartglass: What else can we do? Susan Prolman: Well, one fun thing people can do is to be aware that this upcoming week is farmer’s market week. So if you can, visit your farmer’s market. Caryn Hartglass: This week? The first week of August? Susan Prolman: The first week in August. It starts on Sunday and goes through the week. Caryn Hartglass: So what does that mean? I guess different farmer’s markets will be doing different things, if at all. It’s their week. Susan Prolman: Yes, exactly. Different farmer’s markets around the country are doing different things to celebrate farmer’s market week. But you, as a person who cares about good food, can celebrate by going with your friends to the farmer’s market and talking with your local farmers and asking them questions about how they do, what they do, and buy their products. Caryn Hartglass: Yeah. It really is up to us to make a difference and definitely getting to know our farmers, going to farmer’s markets, talking to people, even if you don’t have access to a farmer’s market, going to your neighborhood grocery and talking to the manager about the food that they’re offering. Caryn Hartglass: Labeling, there’s a good word. Caryn Hartglass: Labeling. So it’s been a painful process to get the information on our food. And I remember some stuff was passed in 2008 that was a bit of a struggle but we’ve gotten, for example, to know where our meat comes from. Susan Prolman: Yes. So labeling is a complicated issue and frankly, I think that there’s so much room for consumer confusion. There are different labels that producers can put on their own food. There are words like “wholesome” that mean something close to nothing. Caryn Hartglass: Nothing. Natural. Nothing. Caryn Hartglass: But natural is not irradiated or it doesn’t have that ammonia process to make it pink slime of something like that. Caryn Hartglass: Okay. But part of the labeling was to find out where food comes from. Susan Prolman: This is again something out of my role as the executive director of the National Sustainable Agriculture and I’ll just talk to individual consumer. Susan Prolman: I like to buy foods that are produced locally or regionally, if I can. Caryn Hartglass: It’s just really nutty that the majority of our food might come halfway around the world. Susan Prolman: It can be really confusing. I’ll give you an example of that. So there’s country of origin labeling. For a time, pigs that were raised in Canada were being trucked to California and then shipped to Hawaii and slaughtered in Hawaii and there was a Hawaii-fresh label put on it. And the argument was part of the process, the slaughtering part of the process, was done in Hawaii; therefore, we can put a Hawaii-fresh label on it. But I think that’s very confusing to consumers because they don’t understand that these pigs came from Canada and endured many days of transport to get to Hawaii. Caryn Hartglass: Yeah. And believe me, it wasn’t first-class. Caryn Hartglass: That’s probably a horrific journey and probably many of them died in the process. Susan Prolman: Yeah. Long-distance transport of animals to slaughter is a concern. That’s, again, why supporting local and regional food systems is helpful. And, again, why advocates for sustainable agriculture have been trying to get it so that smaller- sized producers have access to slaughterhouses. Caryn Hartglass: Yeah. So I think your point as a consumer is important. I know many people complain about the cost of their food. Unfortunately, they don’t really realize the true cost of their food. And when we’re spending the extra money on … Sometimes, farmer’s market food is less expensive; sometimes, it’s more expensive. Organic food can be the same, more or less. You just have to be paying attention. And in some areas, certainly, we have access to more organic and locally grown food than some places but the cost of quality food is worth it from so many points of view. And I think that the government and the farmers need to hear our voice by what we’re paying for. Susan Prolman: Yes. I would also say to your listeners that, if you haven’t done this yet, I recommend going out and visiting a farm, like a local farm where people are really doing things by hand. They work very, very hard and they make very, very little money. When I go to a farmer’s market or when I go to my supermarket manager and say, “Is this produce local? If so, could you label it as local?” I view all of that as an investment in the way that I want my food to be produced. It’s a better system and for society as a whole, that costs less over the long term. Caryn Hartglass: You’re making me think of a lot of things as we just have a few minutes left. I don’t like to get into any kind of doom and gloom scenario but the state of our agricultural system is really fragile. We’re losing a lot of topsoil. There’s going to be areas that won’t be able to grow food soon. We’re depleting our aquifers very quickly because of the way that we grow a lot of food. And we’re not caring for what we really need to care for in order to continue to be able to feed all of us. And then we have this disconnect in our community with so many things; not just with food but certainly with food and farmers. Many of us aren’t mindful; we just grab some fast food, we eat some of it, we throw some of it away. We’re not realizing all of the impact of it. It’s so important that we need to definitely get to know our farmers; they’re working so hard. And there are some people that are farming, like migrant workers and people coming from other countries, legally or illegally and that’s a whole another story; but they really work hard for so little. Susan Prolman: Yes, absolutely. Let me touch on a couple of things there. So among your doom and gloom about depleting aquifers and soil loss, all true; another item to add in the mix there is climate change. Caryn Hartglass: Oh, climate change, yes. I don’t like to mention it because some people believe in it and some people don’t but there are so many other environmental devastating things happening that that’s just one more thing. Susan Prolman: The good news is that the sustainable systems are more resilient. They use less water, they use less energy, they pollute less, and they add nourishment back to the soil more. So that’s really the direction we need to go and that’s why we advocate for more USDA research into sustainable systems. You raised another really important topic that I’d love to talk about, which is socially disadvantaged farmers and ranchers and these include immigrants, minorities, and women. There has been a series of lawsuits at the USDA, successful lawsuits, discrimination claims that pertain to African-American farmers, Hispanic farmers, and others. I should mention, by the way, among socially disadvantaged includes Native American Indians as well. So there are programs that, because of historic unfairness to these producers, have been trying to level the playing field and make it so that producers can be farmers, workers can be farmers in their own right and those who own their own farms are able to thrive and to contribute good healthy foods to their communities. By the way, a disproportionate amount of minority farmers are producing fruits and vegetables, the so-called specialty crops, on smaller farms. Again, they’ve been recipients of systematic discrimination and unfortunately, in the new Farm Bill there’s jeopardy of cutting their funding, which is a real problem. Caryn Hartglass: Big problem. Susan, thank you so much for joining me. I learned a lot. And I really appreciate you coming on the show today. And you know what, it is; it’s all about food. Caryn Hartglass: Okay. Susan Prolman of the National Sustainable Agriculture Coalition. Go to sustainableagriculture.net for more information. And I’m Caryn Hartglass with Responsible Eating and Living. Thank you so much for joining me. Have a delicious week.